Global Economy: What Is the Mayan 5th Night Suggesting? 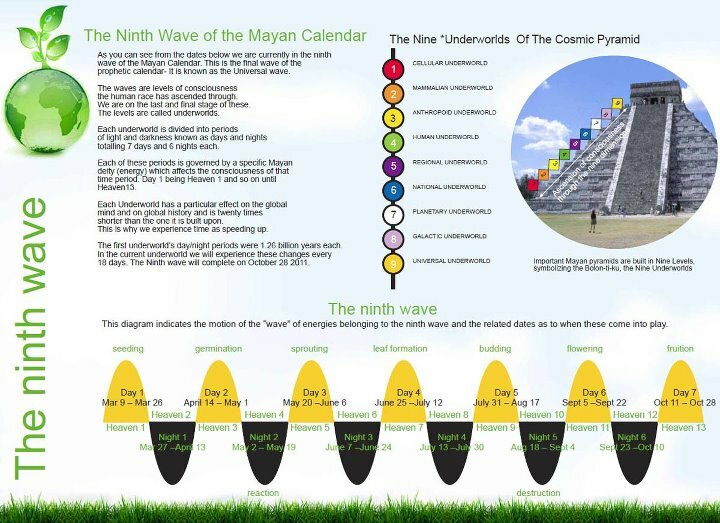 A number of distinguished members of the ATCA 5000 from around the world have pointed out that the Mayan Calendar's 5th Night of the 9th wave starts as of August 18th 2011 and some are wondering what this energy will carry. We are conscious that many distinguished members remain agnostic or doubtful in regard to the significance of Mayan artefacts and we respect their skepticism. Nevertheless, given that ATCA investigates asymmetric threats and opportunities, we feel it appropriate to examine the potential significance of this global event as an interesting curiosity. What does the 5th Night of the 9th Wave herald? The Mayan calendar is comprised of 9 waves or steps of 13 periods. Each of the successive 9 waves are 20 times shorter than the previous wave. The steps of 13 periods are divided into 7 Days and 6 Nights. Each Day or Night has its own character. The 5th Night means a "Dark Age" with some kind of destruction and without exception it has meant a sharp economic decline. The similarities of the effects of this 5th Night have not been easily visible because as can be seen from the examples given, it has different durations in different waves. The frequency of the waves increases at the higher levels because time accelerates in the Mayan calendar system. "To some this downturn may seem like a destructive event, but from the perspective of the emergence of unity consciousness, which is the chief purpose of the Ninth wave, this economic crisis is actually a constructive event that paves the way for the civilization of the future. Based on that assumption it can actually be said that the development of this economic crisis, triggered by the Fifth Day (July 31st - August 17th, 2011) has followed the Mayan calendar with exceptional precision. In the Fifth Day the stability of several major European banks has been seriously threatened and government leaders are now in constant teleconferences to discuss how to handle the crisis. The US, on its part, has lost its status as AAA and 7 trillion dollars of stock value has gone up in smoke. So far the economic crisis has mostly been ‘on paper,’ but as the Fifth Night begins the ‘real’ economy will be affected and leave the old paradigm behind in a very fundamental way." While the ATCA 5000 is agnostic to the hypothetical interpretation of the Mayan civilization and its artefacts, it would be interesting to observe how global events unfold between August 18th and September 4th per the 5th Night of the 9th wave of the Mayan calendar.